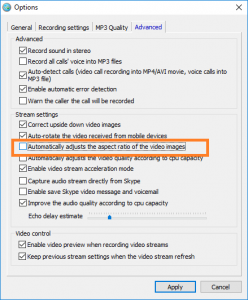 How do I record a full-screen video while talking to a mobile device using Skype? Under the default configuration, Evaer call recorder for Skype will automatically adjust the aspect ratio of the video when the aspect ratio of the two sides is different. If a mobile device is used by a Skype contact that you are talking to, the Skype call recorder will automatically adjust (cut) The video aspect ratio when the video of the device is inconsistent with your video. This will get you the remote contact video with only the middle part of the image. If you want to get the same Skype video image as the original video, please disable the “Automatically adjusts the aspect ratio of the video images” option at Evaer call recorder for Skype software menu Tools > Options > Advanced tab. This entry was posted in Skype Video Recorder and tagged record skype video mobile, Skype video call aspect ratio on April 8, 2018 by admin.